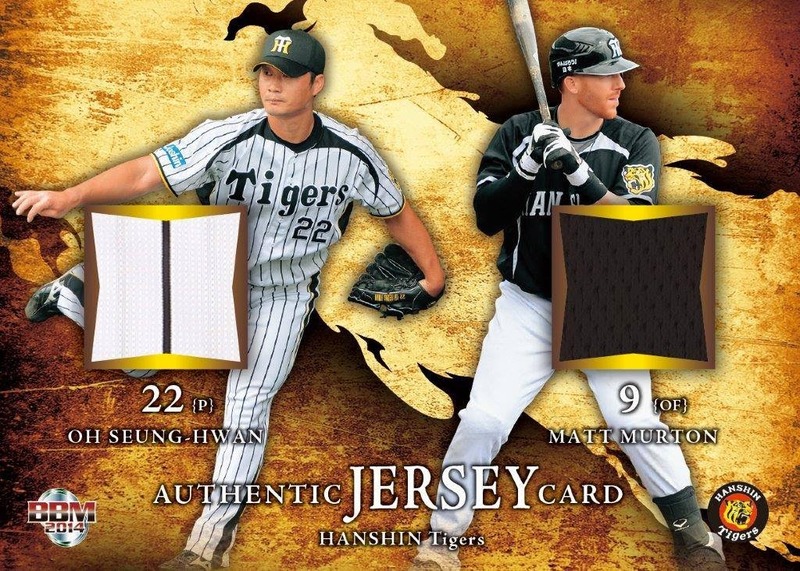 The annual Hanshin Tigers team set came out earlier this month, and it has a ton of subsets. The complete set has 99 cards. The base cards are similar to the Marines set I showed yesterday, though a little less boxy. I think the bottom border is a bit smaller overall, and with the Tigers logo and stylized jersey number it looks less rigid. There are 72 player cards, including one card with all three mascots. Newcomers is a three-card subset with players who joined the Tigers this year, including foreigner Mauro Gomez. Kakefu Children is the next three-card subset. I don't know what Kakefu is supposed to mean - it must reference something to do with the team; kakefu translates as drapes. As in curtains. That might explain the background. There are two Most Improved Player cards. Akiyama's ERA dropped considerably in 2013, but 2012 was an off-year for him. He seems to be doing okay so far this year. The next ten cards are split into two subsets using the same design, just with different background colors. The first is a four card Tigers' Starters set with a green background, with one card for each of the starting pitchers on the Tigers. Statistics on the back are for the first month of 2014. The six card Core of Tigers subset has a red or blue background and has game-by-game statistics through April. I'm not a fan of partial-season stats, mainly because the cards came out over a month after the statistics period ends, which constitutes half of the season to date. But I do like the idea of game-by-game statistics. The last nine cards in the Tigers set are puzzle subsets titled Tigers In Motion. Three players have three cards each. Side by side, there are three background images and nine smaller images, which serve to show pitching, hitting, or fielding motions for the player pictured. 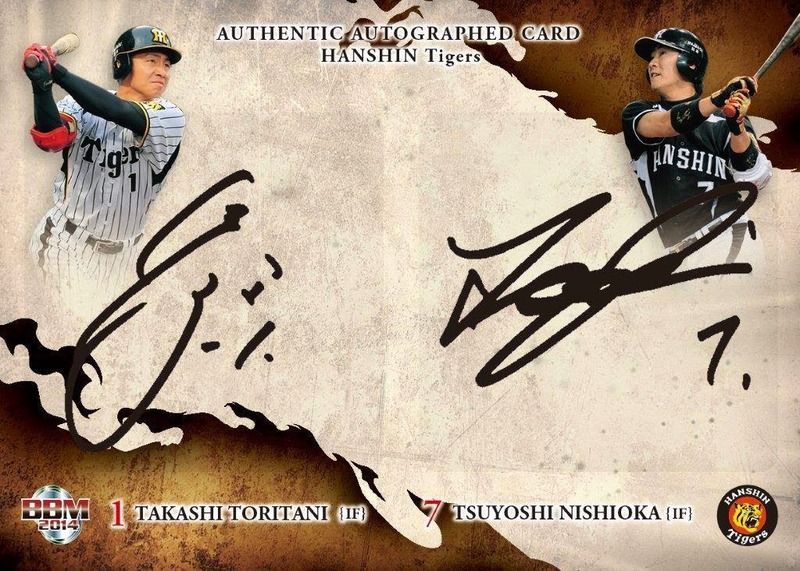 I'm aware of two parallels for the Tigers set, both using foil backgrounds. Tigers' Starters, Core of Tigers, and Tigers In Motion are all paralleled. The more common is a silver foil background numbered out of 150, as seen above. The gold/yellow foil background is numbered out of 50. I'm not 100% certain of the foil colors, because I haven't seen enough copies to compare different serial numbers for each subset. The lone insert set is Tigers Spirit. As always it doesn't have much to it beyond the name and a simple background design. This, too, has a parallel. Tigers Spirit can be found with a holographic foil, serial numbered to 200 copies. 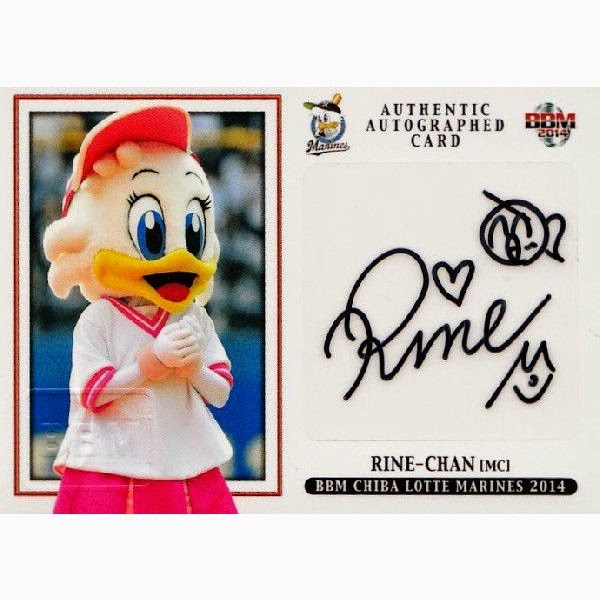 Every player in the base set has an autograph except for Kazuo Ito, with most players having 60 copies each; a few players have less (minimum of 45) and there are 180 of the mascots (it could be three separate cards with 60 copies each). Additionally, there are seven single-signed special autographed cards limited to 10 copies and two dual-signed cards limited to five copies each. Packs have 7 cards each with a suggested retail price of 400 yen; boxes have 20 packs each. In the past couple of weeks, BBM released three more team sets. The Marines team set consists of 81 cards - 72 base cards and nine subset cards (including the checklist). The player cards have all of the basic information at the bottom on the front, using team colors as usual. The design is quite boxy, but being at the bottom and fairly small it's unobtrusive. Team colors and the same layout that you always expect is on the back. Three of the subset cards are "Newcomers" - rookies and foreigners who are new to the team. These have four lime green borders. The backs summarize the player's career before joining the Marines. Skilled Infielders is the five card subset, with red borders that fade to pink. The backs have detailed fielding statistics. As always, there are nine insert cards in the team set, but BBM split the Marines cards into three sets. They have the same exact layout, except for color changes and different numbering on the back. 2013 Award Winners are green; there are two of these. The award is listed on the front. Backs are grey and have a lack of, well, anything. As BBM inserts tend to do. Marines Spirits has two more cards, and uses a red background. The large insert set, Golden Rookies, has a gold (yellow) background and is composed of five cards - all rookies, of course. All three sets are available in a parallel numbered to 200 copies each. Three relic cards are found in packs: Yoshihisa Naruse, Hideaki Wakui, and a combo with both. As you can see by the above image, patch versions are available. 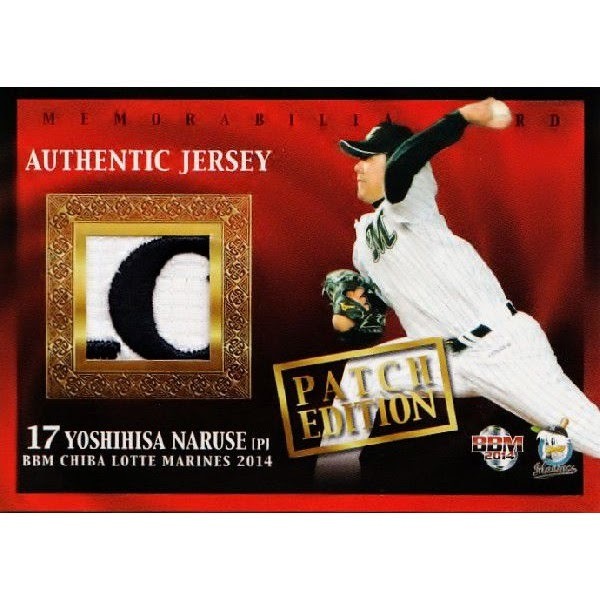 BBM hasn't provided details on serial numbering, but the Naruse patch card is numbered out of 20. As always, autographs are the most-common hits to be found, but BBM didn't give a checklist. The cards I've seen are numbered to around 60 copies each. Like the other team sets this year, a promo set of 9 cards for the Marines was also issued, with the red and black boxes switched on the front; these also have big text on the front identifying that they are Limited Edition and are numbered with a "PR" prefix. I've basically limited my pack opening in Japan to Calbee and a single pack of each series of Topps, along with the occasional non-sports pack or a box of Triple Play. I've been sitting on this pack for a couple weeks, so let's see what's inside, shall we? First, some of the base cards. The photography is crisp and clear and bright. And it's a lot of the same. I like shots that show interaction between ballplayers, especially when Padres learn how to levitate. I didn't know anything about Matt Kemp, Clayton Kershaw, or any of the Dodgers for that matter before I started reading others' blogs. I've liked McCutchen for several years, and this is a really nice horizontal shot. I just wish Topps had more images where the batters were actually connecting with the ball. Getting a little tongue. This set has a lot of close-up pitcher photos. Another levitating player! Or is Galvis about to deliver a high kick to a teammate? Look! A sepia parallel in Topps flagship! Or, wait, it's just those silly brown camo uniforms and a) a vitamin deficiency b) a lack of sunlight or c) color adjustment errors. I think the entire White Sox team is shown in their throwback uniforms. I like seeing players in throwback uniforms but it would be better if Topps just made a set devoted to showing players in throwback uniforms. Or do that with one of the parallels or as not-terribly-SP'd variations. One year I might actually try to assemble a full set of a colored parallel. Since it's World Cup time, I'll say GOOOOOOOOOOOOOOOOOOOOOOOOOOOOOOOOOOOLD. I don't know why but I kind of like this set. Probably because the titles are either uninspired or over-inspired. A lot of the inserts I didn't get in my Series 1 pack showed up here. But I got those inserts from trades and purchases. Patience would have paid off, I suppose. My scanner cut off the borders, but I pulled a black-bordered parallel #/63. I already have one for my type collection, again thanks to eBay or a trade or something. Here's a nice new insert that I like, because it's confusingly educational! What is UZR, exactly? And for the first time in about three years I pulled a hit from my single pack! And again, it's a card from a set I picked up on eBay. When will I ever learn? I'd like for Topps to take a gamble or at least have some fun with the flagship set, but it's so formulaic now I'm not sure what to think. I'll be getting my usual base set sometime after Update is released, but I think that's about it other than the 1989 Minis. State of the Blog Address: May/early June?